SICK, Inc., the North American subsidiary of SICK was established in 1976. SICK Product & Competence Center Americas, LLC (PCA), the shared services, manufacturing and production subsidiary was established in 2017. Our U.S. headquarters are located in Minneapolis, MN and we have sales offices throughout the U.S. In addition, SICK has more than 50 subsidiaries worldwide. Our goal is to help our clients achieve their goals: high production rates, short processing times, safe environments and consistent high quality. We design and manufacture our cost-effective products to achieve a high level of precision, reliability and versatility. In addition, we have more than 70 years of application experience and a full-service support organization with 24/7 telephone assistance to meet the emerging needs of our customers. Since our inception, we have led the world in opto-electronic safety solutions for hazardous machines and work areas. SICK continues to develop innovative point-of-operation devices, optical perimeter and area guards. Advanced functions of our safety control devices include fixed, floating, and multiple point floating blanking, Presence Sensing Device Initiation (PSDI) and multiple configurable muting controls. With an innovative line of bar code line scanners, omni scanners, vision-based reading systems, integration software, and dimensioning products, SICK offers the industry's broadest range of solutions for automatic identification applications. And, we have more than 50 years of application experience and a full-service support organization with 24/7 telephone assistance to meet the emerging needs of our customers. High-performance, flexibility and simplicity are the hallmarks of SICK's bar code scanners and systems. Our Environmental Monitors division is a worldwide supplier of opacity, gas, dust and flow analyzers. SICK's equipment utilizes in-situ technologies to provide the most cost-effective installation, operation and maintenance. SICK embodies quality in its commitment to completely satisfy the current and future expectations of our customers. To meet this commitment we establish long term relationships with both our suppliers and customers. SICK commits to comply with all standard requirements and utilize continuous improvement as means to improve the effectiveness of the quality management system. SICK, being aware of our responsibility to the environment, is dedicated to continual improvement and the prevention of pollution through the setting and reviewing of our environmental objectives and targets, and promises to comply with all applicable environmental legislation and regulations. In addition, we are committed to the economical use of resources, minimization of emissions, and the development of environmentally friendly products. SICK management ensures that all SICK personnel, who are key to the achievement of our goals, have the awareness and skills to participate in and carry out this policy. 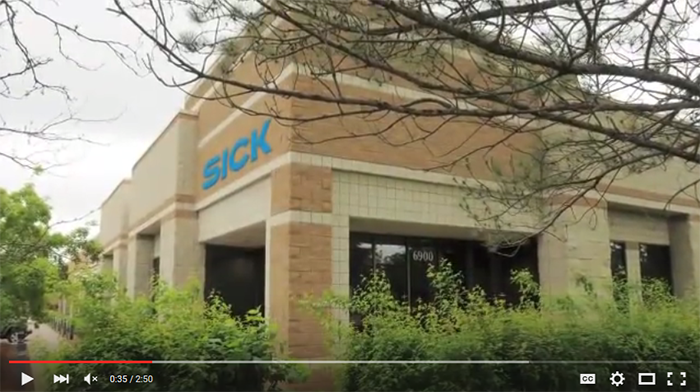 SICK is proud to be certified to the ISO 9001:2015 and 14001:2015 standards. Voluntarily pursued by organizations committed to customer satisfaction, ISO 9001 certification ensures the quality of our design, manufacturing and service process. It verifies that our products and services are produced with documented quality control procedures that meet global standards. SICK products are designed using the latest available technologies and cost-effective manufacturing methods for exceptional customer value. We recognize that each application requires absolute dependability and the products we sell must fit into a wide range of environments. That's why we design our products using state-of-the-art hardware platforms, the best available designs and the latest in communications capabilities. The result is products that are more compact, easier to install and maintain and packed with the latest technological advances for maximum ongoing performance and reliability. Our industrial sensors, automatic identification solutions, machine vision, and safety systems lead the industry in new technology and innovation.